NigelMillard.com :: International Portfolio :: PRO IT Service S.R.L. - Choose a professional and accessible service for your online image! 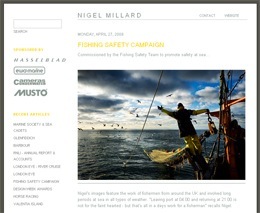 NigelMillard.com is the News Website of the Nigel Millard London-based photographer. Nigel Millard is one of the photographers that work at hmmm... media Ltd, a photography studio based in London. I've developed the hmmm... news blog Website way back in 2007. At the moment Nigel wanted to create his own news blog. It's been a pleasure to work with the hmmm... media staff over time. During the fall 2007 while I was spending some time in London, I even wanted to visit then, but I've failed due to a very busy schedule with a few publishing companies. This time Nigel told me that he wants to have his own News Website which would be based on the general structure from the hmmm...media news Website, but which would include some restyle work. He wanted to also incorporate all the posts he published on the hmmm...media news website. As I'm hosting the hmmm...media News Website and they are very happy with the service, Nigel wanted to host together also this new Website. After configuring his hosting account, I've installed a stand-alone movable type setup for this project. At Nigel's request, I've ported all his posts from the hmmm...media New Website to his NigelMillard.com News Website project. In order to handle this operation in a professional way, I've redirected all the URLs from the hmmm...media News Website that where referencing Nigel Millard's stuff to the corresponding URLs from his own Website project. This in one hand avoided possible duplicated content penalization and also helped with rapidly crawling the just developed NigelMillard.com Website. Nigel told me that in principle his Website would look similar to the hmmm...media News Website, but that he would like to make some changes to the interface design here and there. So he prepared an interface design document and he sent it to me along with some notes explaining it. On coding Nigel's News Website design I've had to make some changes to the templates, as well as tweak some stuff on the CSS document. Nigel's photographs are so beautiful, that I couldn't resist sharing with you a screenshot. Contracting from Nigel Millard studio, Devon, England, U.K.